Rovio’s Angry Birds Star Wars mash-up launched yesterday — and took just 2.5 hours to reach the number one spot in the U.S. App Store. In a blog announcing the figure, the games maker noted that the speed with which its latest Angry Birds incarnation rocketed to the top of the chart beat all its previous records. The game is also currently topping the U.K. iOS App Store paid app chart. Angry Birds Star Wars recasts the Angry Birds as plucky Rebels, battling the might of the evil Imperial Pigs across more than 80 Star Wars-themed levels. 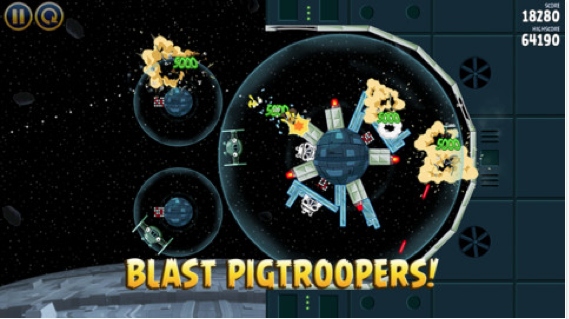 Rovio is not breaking out actual download figures for Angry Birds Star Wars as yet, but early signs suggest its fowl-flinging cash-cow remains in rude health.